I wavered for years, advocating socialism first as a racial program; then as a national effort and after this trip of 1958 as a definite and direct step to join the world movement toward a socialism leading toward communism, and embracing the colored world and that part of the white world willing to give up colonialism and private capitalism. But, as I say, this decision was slow in the making. ....Pan-Africa, working together through its independent units, should seek to develop a new African economy and cultural center standing between Europe and Asia, taking from and contributing to both. It should stress peace and join no military alliance and refuse to fight for settling European quarrels....should try to build a socialism founded on old African communal life...in peaceful cooperation and without presuming to dictate as to how Socialism must or can be attained at particular times and places. No sooner had I come to this conclusion [the necessity of socialism] than I saw that I was out of touch with my organization and that the question of leaving it was only a matter of time. DuBois illustrates a most important truth that can be quite painful in its operation: that consciousness development, in order to avoid sectarianism, often requires one to leave organizations with narrow perspectives and to seek out new affiliations with a broader view. 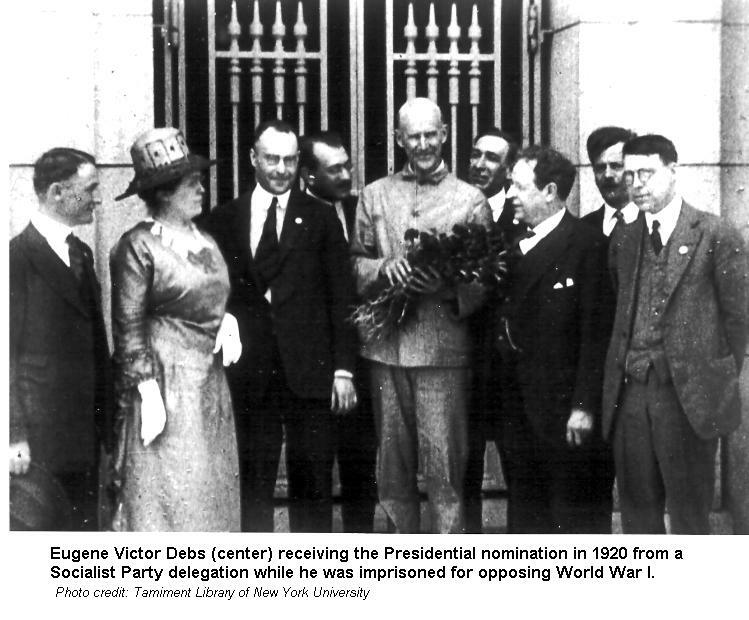 Eugene Victor Debs (center) receiving the Presidential nomination in 1920 from a Socialist Party delegation while he was imprisoned for opposing World War I.
Eugene Victor Debs progressed from one plane of activity to another in much the same way as DuBois, widening its scope until it encompassed the whole world. Debs began with a narrow sectarian view of labor federations, first only the locomotive firemen, then all the railroad workers, then all the working class, and finally came to a political commitment to socialism as a system of peace and justice for all people in the world (see quotation on page 14). Just as DuBois did not develop his analysis in isolation, but in dialogue with the Communist Party, so Debs developed his analysis in affiliation with the Socialist Party of his day. Perhaps more than any other single event, that visit to Cuba in November 1969 on the first Venceremos Brigade focused the rest of her life....Sandy saw that socialism was possible, could be successful. She could see it, touch it, examine it....It was tangible; it could work.